//finally, output this pixels colour back into the texture, storing screen space related data. In the above code (lump of comments) I can tell that I am going to run into some problems. The VertexData struct contains mesh data per vertex, but I want to run a thread for each pixel in a texture and then figure out what my pixels position is on a triangle. In a regular shader, this would be interpolated from the vertex shader when using data in the fragment shader, but from my little knowledge of compute shaders, this would require something extra. In the back of my mind I feel like its going to end up being something to do with Barycentric coords, but I just can't put my finger on it! The desired end result is a texture mapped to the UV coords of a mesh, storing the screen space positions of each pixel on the mesh. If there is a better way of tackling this, please let me know! You seem to do things more complicatedly than you need to, as adressed in the comments. What you actually want to do is simple the opposite of the normal render flow. Rather than drawing your mesh in world space and mapping the texture into it, you draw it in texture space and map its vertices onto it and let your graphics hardware worry about interpolation. I'll give the general outline here, as I honestly don't know the actual DirectX terms for the stuff here, but it should be easy to map onto real HLSL if you know your way around DirectX (which I'm sure you do when messing with Compute Shaders). 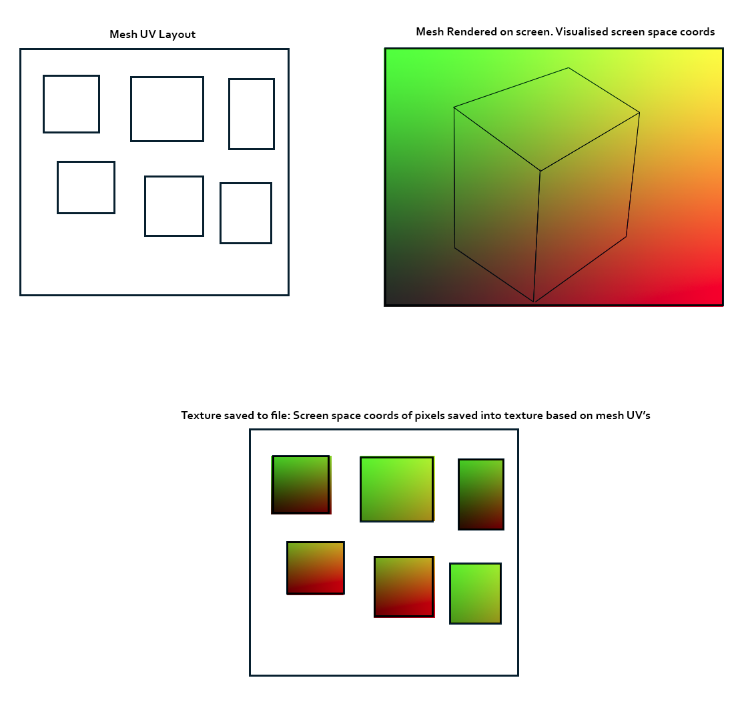 Feel free to adjust this to the realities of proper DirectX screen-space transformations and matrix multiplication orders, but the general idea should be clear. Not the answer you're looking for? Browse other questions tagged shader compute-shader hlsl uv-mapping or ask your own question.